“Arsenal” tells the intertwining stories of the Lindel brothers, Mikey and JP, who had only each other to rely on growing up. As adults, JP found success as the owner of a construction company, while Mikey became a small-time mobster, mired in a life of petty crime. When Mikey is kidnapped and held for a ransom by ruthless crime boss Eddie King, JP turns to the brothers’ old pal Sal, a plain clothes detective for help. In order to rescue his brother, JP must risk everything and unleash his vengeance against King’s relentless army of gangsters. “Oh, you think we’re even you and I? Nicolas Cage is known for his wayward choice in terms of films recent years. His career had some ups and downs. As a result, the opinions on his acting talent in the world of film lovers are rather divided. His performance as Eddie King, a manic, coke-snorting, aggressive underworld figure, who’s also not afraid to handle opponents in a rough and cruel way, is an exceptional case. At first sight it isn’t a thunderous acting performance that he delivers and it tends to be rather ridiculous. A kind of cartoonish character whose tantrums and neurotic behavior comes across as exaggerated. At first glance he looks like a parody of Tony Clifton (an Andy Kaufman impersonation) with a weird wig, a walrus-like mustache and glued on fake nose. Let him wear some oversized sunglasses on his fake nose and you’d swear it’s Roy Orbinson. But at the same time I thought he was incomparable. In other words, it’s hard to define Cage’s acting as being woefully bad or masterfully brilliant. Unfortunately this isn’t sufficient enough to assess “Arsenal” as an excellent film. The story on its own isn’t really brilliant or innovative. To be honest it’s mostly boring and meaningless. The main characters who actually carry the entire film, with Cage in the background acting as an accessory to flare up the tension with bloody and highly aggressive scenes in slow motion, are JP (Adrian Grenier) and Mikey (Johnathon Schaech). The beginning shows how the two experienced their childhood. A not so rosy picture of two future-less teenagers who spend their time hanging around in an arcade, because it isn’t so pleasant to be at home. One day Mikey comes home and makes a shocking discovery. That’s a crucial moment. From there on their path go into opposite directions. As you can witness when they are adults. JP is the person who walked the honest path. He’s the owner of a successful construction company. Mikey on the other hand, has chosen the side of Eddie King and ends up as a small-time gangster. After being robbed and losing a package of valuable drugs and not being able to pay of the money he owns Eddie, the latter has this masterful plan to arrange the matter. Now the truly honest brother must pull out all the stops to save Mikey. And that’s what this movie is all about. The whole movie revolves around the loyalty between the two brothers. Even if Mikey is a loser whose life is a concatenation of making wrong decisions and crime, yet JP remains faithful to him and he does his utmost to free him. And this with the help of Sal, a sort of undercover agent played by John Cusack who’s wearing a bandana and holding an e-cig. The only purpose he has is to provide JP the necessary clues so he can track down those who are responsible. Trust me, it sounds more fascinating than it looks. The initiative to fill the film with bloody, raw violent scenes with lot of blood flowing freely out of inflicted injuries from the victims, won’t ensure that “Arsenal” rises to an acceptable level. And may I also inform the sports fans for a moment? There’s a lot of kicking around, but the film has nothing to do with the famous soccer team. Ultimately, “Arsenal” didn’t become the thriller it intended to be. The story was too simplistic, the violence too excessive and the characters too one-sided and uninspired. Strange but true, the only bright spot in this film is the exorbitant and crazy role played by Cage. Normally, the failure of a film is mostly due to the failure of Cage’s contribution. 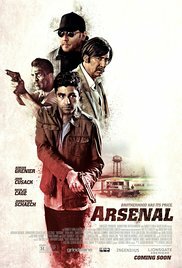 “Arsenal” is in my opinion a low-budget movie with kinda sounding names participating in it. Yet another proof that this isn’t a guarantee to get an excellent end result. Finally, the most striking fact I saw in this film. Despite 23 years passed and the two brothers grew into adult men with graying hair and beard, Eddie King still had the same appearance. Apparently sniffing hallucinogenic drugs has a preservative effect.